Cincinnati Chili is decidedly different and delicious. This chili is a combination of Macedonia and Greek flavors mixed with conventional chili flavors in a delicious meat stew. I was born in Kentucky. Hence the Beer Cheese, Derby Pie, and Hot Browns. Those last two I’ve made in a few different variations. It will always be home even though I haven’t lived there since I was 7. You’re saying, “What does this have to Cincinnati chili?” Where we lived in Kentucky was pretty darn close to Cincinnati. I am a Cincinnati Reds fan just like Nana. We used to be Bengals fans until we moved to the Washington, DC area. Now I’m a Reskins fan. Don’t hate. But, I don’t remember having Cincinnati chili when we lived near there. I do remember Skyline Chili when we moved to Northern Virginia. GO figure! 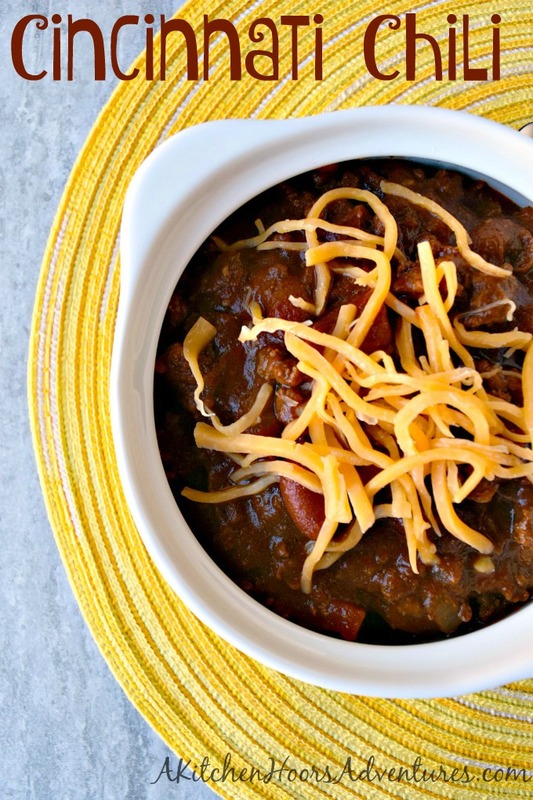 If you haven’t heard of Cincinnati chili before, then where have you been? Next to bean or no bean it’s 5 way, 4 way, etc. While I’ve been eating this type of chili for a while, I had no idea that one way is just the chili. Who says that? It’s at least two way. And I had no idea that five way had beans. So, there’s already beans in there. You’re at least getting two way when you make it. What’s so special about this chili? It has a different flavor to it. It has chocolate and some other sweet spices in it. Cincinnati was like a melting pot for Macedonia immigrant restaurateurs. Macedonia, even though it’s in Europe, has more Mediterranean flavor to its dishes. This includes influences from Greece. Have you heard of pastitsio? Or have you seen my pastitsada meatballs? You should check them out. They’re really delicious and explain how Cincinnati chili sort of came about. The flavors in pastitsio or pastitsada are in Cincinnati chili. This Cincinnati Chili has tomato and beef flavors. That’s a given. It also has a little bit of chocolate, some cinnamon, and some allspice. Not a lot. Trust me. It’s just enough to have an additional level of flavor that your guests may or may not be able to pinpoint. I love recipes like this one. Just look at how dark and rich that chili is. It has complex, delicious flavor that your family will ask for time and time again. The chocolate adds almost a mole type flavor. The cinnamon and allspice are layers of flavor that add intense flavor and depth. I can’t wait for chili season to start again so I can make this chili. Heat a large Dutch oven coated with cooking spray over medium high heat. Sauté onions until they begin to soften before adding the garlic. Sauté 1 to 2 minutes or until the garlic becomes fragrant. Crumble the ground beef into the pot to brown. Once the beef browns, stir in the tomato juice, beef broth, and tomato paste. Stir well to make sure the tomato paste is dissolved. Stir in the next eleven ingredients (kidney beans through cloves) and bring to a boil. Reduce heat to a simmer and cook 1 to 2 hours or until thickened and the flavors have combined. Divide the spaghetti between four plates or bowls. Top with a ladle or two of chili and top with red onion and cheese. So funny but when we moved to Indiana everyone laughed that I ate my chili on spaghetti. Didn’t know why they laughed because surely they had heard of it being so close to Cincinnati. But my grandma always made it like that. I mean it is really a “meat sauce” for your pasta right? I just love the chili flavors with pasta way more than with rice or crackers. Who are those people that crumble up those crackers in chili?? I have no idea. I eat saltines with American cheese with my chili that’s NOT Cincinnati style. It’s how I was raised. I say, eat it how you love it! That’s all that matters. I have had Cincinnati Chili on my ‘to make’ list for a while now. Yours looks SO GOOD!!! Can’t wait to try it now! I have always wanted to try Cincinnati chili!! I am adding this one to my MUST try list! YAY! I hope you like it as much as I do. I love homemade chili! It is just the perfect meal for cold days! I can’t wait to make this soon! Thank you! I hope you enjoy it. I’ll be putting it on the menu again, too. Ooh I just love all of these ingredients! And cocoa powder? That will so deepen the flavors – this sounds just delicious and we are really going to love these new flavors. Can’t wait to give it a try!! Thank you! I hope you enjoy it. It’s a family favorite. I’ve seen a few recipes for Cincinati chili but I have yet to try tasting or making it. The list of ingredients looks both daunting and intriguing but it was the cocoa that not only grabbed my attention but also moved this recipe up several notches on my “must-make” list. Your version looks mouthwatering and my only regret is that I wasn’t there to enjoy it; nicely done, once again! Thank you! It’s just enough cocoa powder to add a decadent richness to the chili. It’s definitely a family favorite. This is a big family favorite here!! I can imagine so!! It has many flavors that are combined in Middle Eastern flavors. I’ve never had Cincinnati Chiki but I’ll take mine 5 way, please! I can just imagine how delicious this chili smells while cooking. I’ve only eaten chocolate in a stew, so I’m definitely in the “where have you been” category – lol You’ve convinced me to get this on my menu rotation! I hope you like it! It’s an interesting combination of ingredients but makes for a rich and amazing chili. You’ve got it! I think I could eat chili all the time. I’ve even put chili on top of eggs in the morning.